Though it looks like where a child stores toys, this colorful Toybox Tiny Home is actually made for living in. Tiny homes are growing in popularity, especially in areas where people aim to be environmentally conscious and economically wise. The convenience of being able to build on a smaller piece of land not only saves buyers money on property taxes but also saves consumers energy costs. 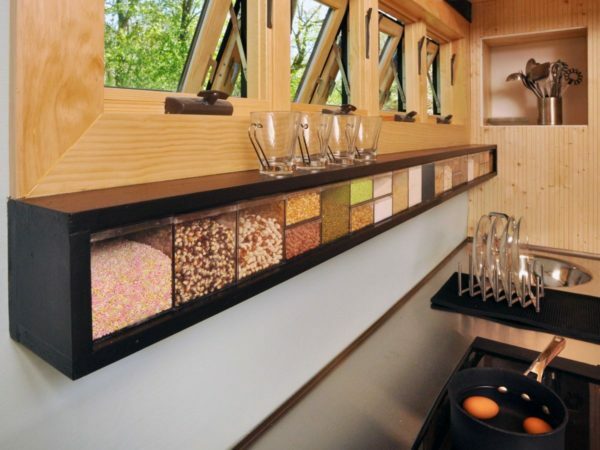 What makes the Toybox Tiny Home special is that it is made out of ecologically responsible material while still maintaining the sleek, modern design that people love about tiny houses. You can see the various materials used here. The placement of the windows allow for lots of natural light and ventilation. The home is sold with cube-style seating which can be used versatilely as a storage, a coffee table or a comfy nap spot. Built on a tandem wheel trailer and using 104 square-feet of space, the inhabitants of the home have everything necessary to live comfortably and functionally in the tiny space. The bedroom fills the loft space and is so cozy that you'll sleep like a baby up there. The kitchen is the perfect size for making home-cooked meals, and who needs a huge pantry when you have these modern dry storage cubes? Our favorite features are the Blown in Blanket insulation and floor heater, meaning Toybox Tiny Home owners are sure to be comfortable in any season. LED strips and outlets are placed throughout the home to provide power and lighting. If you're interested in owning one of these beautifully crafted Toybox Tiny Home designed by Frank Henderson and Paul Schultz, you can donate to their GoFundMe account, or you can contact them via their website. Their first tiny home is currently being sold for $48,000.